If you’ve invested in a Ranger boat, you’ve likely done your research and chosen the brand because of its time-tested commitment to quality. With that in mind, when we work with Ranger boat repairs and restorations, we take care to make sure your investment is protected at every turn. Any work we do is of the highest quality possible, whether we’re dealing with fiberglass boats, aluminum Ranger boats, saltwater boats or Ranger pontoons. 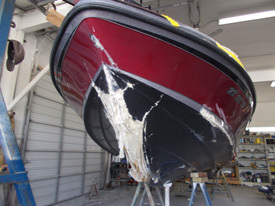 If you’re looking for a reliable, quality Ranger boat body shop in the US, no matter where you are, Anchor Marine Repair offers 45 years of combined experience among our technicians – all of whom have been with us for at least 10 years. With our level of expertise, you can bet that whether we’re repairing a storm damaged Ranger boat, restoring an old Ranger model, or renovating and upgrading your Ranger boat, you’re guaranteed to be satisfied with our work. As fiberglass Ranger boat technicians, we’re familiar with the challenges and requirements unique to fiberglass boats, and we’ve come to include all forms of repairs and restorations in our fiberglass boat services. That means that whether there’s structural damage to your fiberglass boat or you need new wood flooring or carpeting, our team knows what to do – and how to do it right. Aluminum Ranger boats are often more durable in some ways than their fiberglass counterparts, especially because they’re wood-free and completely welded. This means repairs are typically simple fixes. That said, we can handle even the nastiest of accident damage or storm damage, and we’ll provide any restorations or upgrades you could want. Saltwater boats are uniquely designed to thrive on the ocean, whether you’re facing large swells or coasting across calm waters. We understand that a saltwater boat needs to perform at its best all the time to keep you safe and help you enjoy your time on the open waters, and that’s why we put our all into making sure our saltwater Ranger boat repairs are done with the upmost care every time. That includes restorations and upgrades, which can play an important role in making sure your boat lasts as long as possible. Between the harsh salt water, whipping winds, big swells, and burning sunlight, a saltwater boat can take a beating – and that’s where we come in. Pontoon boats are great for a number of uses and have the benefit of being durable and long-lasting. That means when you invest in a Ranger pontoon boat, you want the best possible Ranger boat shop with a team that’s familiar with the brand and your type of boat to complete the repairs; in short, you want us. If you’re looking for a US Ranger boat body shop for repairs, restorations, or upgrades for your boat, whatever the types, look no further than Anchor Marine Repair. Contact us at 763-972-3540 or service@anchormarinerepair.com, and find out why our shop is trusted not just in our home state but throughout the country.